Children love creating their own meals. These tacos, with their colourful filling, are fun to assemble and eat, full of goodness and low in salt. Preheat the oven to 200°C, gas mark 6. Cook the rice according to pack instructions. Meanwhile, heat the oil in a frying pan or wok and cook the chicken for 2-3 minutes, stirring in the meat seasoning, until the chicken starts to colour. Add the pepper and courgette and continue cooking for a further 7-8 minutes, until the vegetables are soft and the chicken is cooked through. Stir in the honey and allow to bubble for 1 minute to coat the ingredients. Place the taco shells directly on the oven shelf and heat through for 2-3 minutes. Stir the mango pieces into the rice. 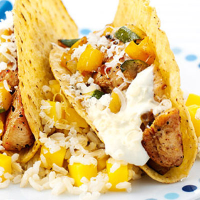 Pile the chicken mixture into the taco shells and top with a little cheese and soured cream. Serve with the mango rice. Add your children’s favourite vegetables to the chicken mixture, or add peas or beans to the rice instead of mango. Serve with a refreshing glass of Waitrose Pressed Apple & Mango Juice.